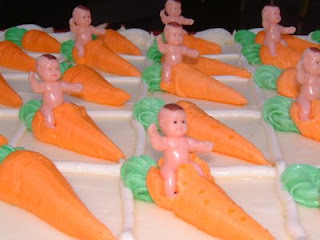 Adventures in Wellington: And now for... Naked Mohawk Babies on Carrots!! And now for... Naked Mohawk Babies on Carrots!! OK, so last night some how (in my sleep) I seemed to have twisted or messed up my back in my usual "how is that possible" fashion. So here I sit on the couch with my loving wife snickering at a blog with pictures of cake disasters and came across this beauty. I swear to you it hurts a bit when I laugh right now and I was almost in tears and got light-headed from seeing this. It is truly one of the most bizarre images I have ever seen, not to mention that it is on an actual cake. Thanks a lot, Darren: Do you have ANY idea how much time I just wasted looking at cakes? Um, got any more sites like that to pass along?